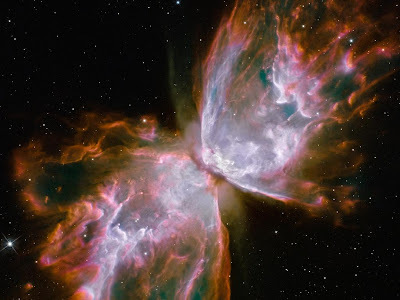 This celestial object looks like a delicate butterfly. But it is far from serene. What resembles dainty butterfly wings are actually roiling cauldrons of gas heated to more than 36,000 degrees Fahrenheit. The gas is tearing across space at more than 600,000 miles an hour -- fast enough to travel from Earth to the moon in 24 minutes! NGC 6302 lies within our Milky Way galaxy, roughly 3,800 light-years away in the constellation Scorpius. The "butterfly" stretches for more than two light-years, which is about half the distance from the Sun to the nearest star, Alpha Centauri. The star’s surface temperature is estimated to be about 400,000 degrees Fahrenheit, making it one of the hottest known stars in our galaxy.